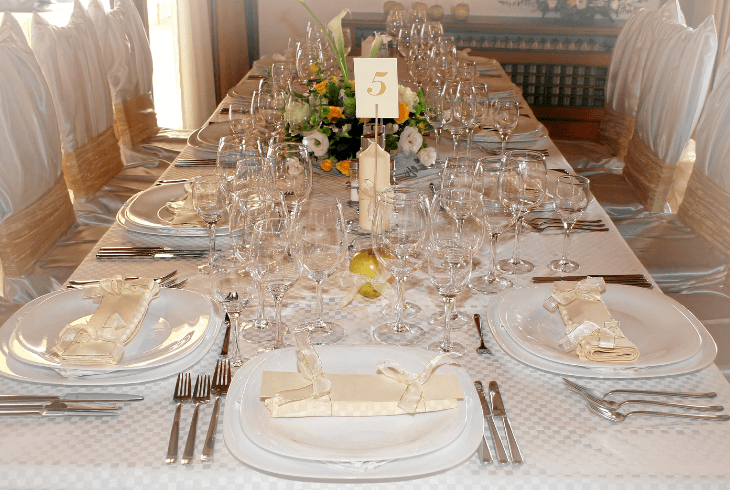 Weddings are a special and often highly-awaited celebration of what you love most in life. Although this is usually your partner, weddings give you and your special someone a chance to share your style and idea of a good time with your close friends and family. There are many ways to celebrate, and for a coffee-loving couple, that may be with a cup of joe. Coffee holds a special place in many people’s hearts, and because it has such a cute aesthetic to begin with, there are tons of ways to incorporate coffee themes into your wedding celebration. Whether you choose to have an open bar, coffee bar, or both (hello, Kahlua), your wedding is a fun opportunity to celebrate your favorite aspects of life with your friends. 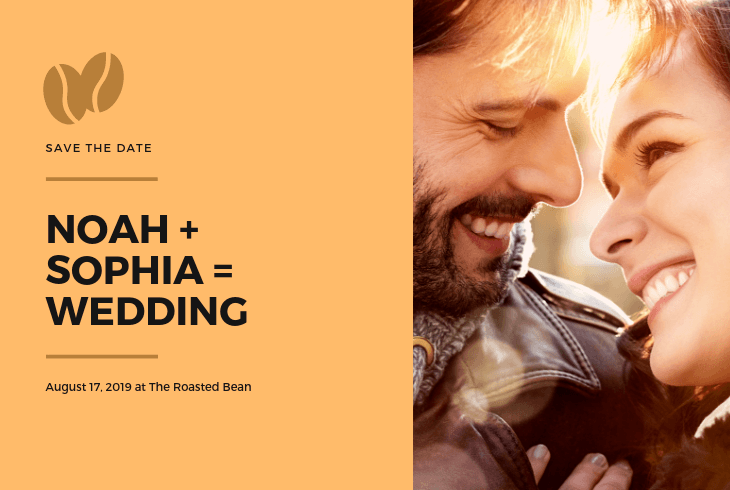 If you, like so many others, fell in love with your affianced over an espresso, you might want to celebrate your wedding with a taste of what brought you two together. This can be an especially fun element to play up if you both bonded over your love for the nuances of various coffee styles, flavors, beans, and combinations. Although everyone at your wedding might not share your same love for the hot bean water, a coffee bar helps offer a tasty alternative to alcohol for those who are not yet old enough to drink, or simply prefer not to. If you were thinking about making your special day a destination wedding at any point, it could easily be made into a coffee-themed wedding by heading to some popular coffee towns. You could get married in the beautiful Pacific Northwest, where cities like Seattle, Washington, and Portland, Oregon, have some of the best coffee west of the Mississippi. If you’re hoping to make it a true destination wedding, grab all of your friends and have your wedding in the coffee hot-spot of Medellin, Colombia, where your theme wedding can be hosted on the white, sandy beaches of one of the most famous countries for coffee. Whether you choose to go for a trip, or support your local, independent coffee shop, your coffee-themed wedding can be a lot of fun anywhere. There’s a lot of clever decorating potential in themed weddings, and with the amount of hype that constantly surrounds coffee, you may not even have to come up with your own puns to use to make your guests cringe. There are a ton of other great decor ideas to implement that will make your wedding day truly memorable to your friends and family, and will make them remember you and your new spouse’s love for coffee for years to come. 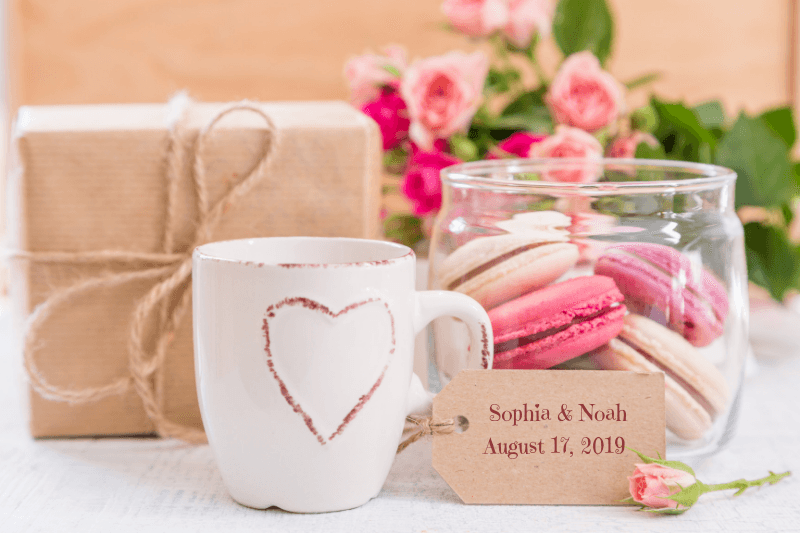 If you’ve decided to follow through with a coffee-themed event, give your guests a taste of what they can expect at your wedding with cafe setting invitations. For an engagement photo-shoot, you and your sweet can get your camera face ready and head to an intimate corner of your favorite coffee shop. Consider engraving a couple of cute latte cups with Mr. and Mrs. or whoever’s name you’re both taking, and have your photographer take photos of you two in your natural habitat. These will be great for the invitation and will make for a fun little memory. Wedding registries are super helpful for guests who want to get a gift for the happy, newly-wed couple. Although your guests are likely to get the hint about your joint hot-beverage passion from your invitations, it doesn’t hurt to push them in the right direction for gifts. There are a ton of appliances that are commonly gifted at a wedding, but help your guests help you buy putting barista level accessories on your wedding registry; such as coffee joulies, stainless steel frothing pitchers, portable milk frothers, latte art stencils and many more. This way, when they arrive at your wedding, they’ll feel really good about their gift to you. Your coffee-themed wedding decor can be as elaborate and intricate, or as laid back as you want it to be. Coffee colors can make for very versatile decorating opportunities, so you can decorate with mostly white, and add some light caramel and beige colors to accent the rest of the decor. Alternatively, you can do areas of dark browns and blacks for a more dramatic effect. If your wedding is in the fall months, the warm browns will match the weather aesthetic perfectly. Either way, the most important aspect of your coffee-themed wedding will be the coffee bar, as that is where the magic will happen. You can make the bar self-serve and practical, with darker tablecloths to hide the soon-to-spill syrups, milks and chocolates; or you can make it elegant, with glass over white tablecloths, and your favorite baristas behind the bar taking orders. 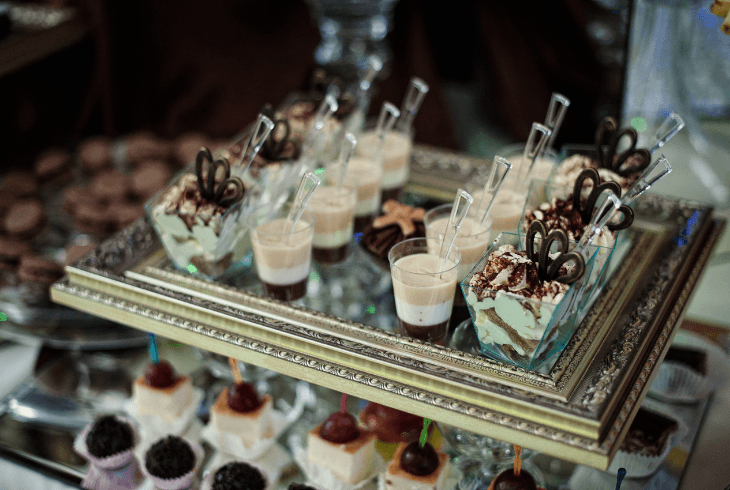 With an awesome coffee bar at your wedding, you may want to consider how to coordinate it with your baked goods. Although you don’t need to make your wedding cake a coffee cake, it may be a good idea to add a baked good that pairs well with espresso, such as cake pops or donut pops. These can be a lot less messy than other treats, and can provide your guests with an irresistible sweet crunch to eat while they sip on their espresso. You can also organize dipping stations with a variety of sauces and toppings so your friends can customize their own. Party favors are a fun way to send your loved ones home with a piece of the night, and waking up to a rich cup of joe the next day is a no-brainer. You can take the party gifts as far as you want, either with a print of your names on a coffee sack filled with whole gourmet beans, some small coffee cakes for their next day, or you can even create an iconic symbol to serve as your wedding logo and have wedding totes custom made for your guests. There’s a lot of pressure for weddings to be one of the happiest days in a couple’s lives. However, using the day to celebrate what you love and to have fun with the decor through a theme can help bring the whole event together for you and your life partner. A coffee-themed wedding can get you and your partner’s life started off together in a fun and meaningful way.